The Montreal Children’s Hospital’s Asthma Centre is dedicated to treating pediatric asthma in children aged 1 to 18 years old. 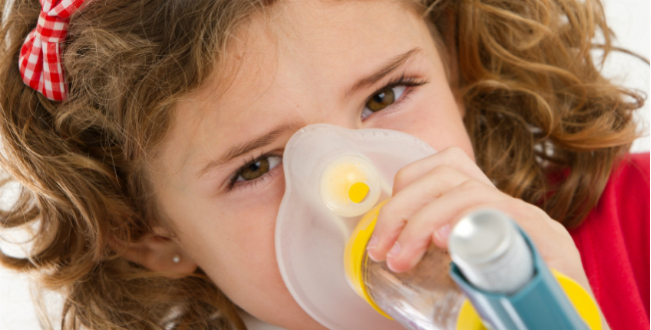 We also treat many patients with recurrent viral wheezing, which is typical in toddlers and preschoolers. The Montreal Children’s Hospital’s Asthma Centre is dedicated to treating pediatric asthma in children aged 1 to 18 years old. We also treat many patients with recurrent viral wheezing, which is typical in toddlers and preschoolers. We provide effective tools to help you manage your child’s asthma through medical diagnosis and treatment, patient education, as well as allergy and respiratory testing. Diagnostic allergy skin testing and pulmonary function testing (also known as spirometry and oscillometry) are also available on site and Telehealth services are available on demand. Our department also serves a teaching function for patients and their families through the Asthma Education Centre (AEC), which is part of the Quebec Asthma Education Network. Visits to the AEC are centred on educational activities, rather than physician assessments. Referrals to the clinic and the AEC are accepted from community physicians, and through the Emergency Department and Inpatient Services at the hospital. Consultations may include pulmonary function testing (children over 5 years of age), allergy testing, and asthma education. The Asthma Clinic was created in 1990 along with the Pediatric Consultation Centre. Since then, we work in close association with the Allergy Clinic so that allergy testing can be arranged for children already being seen in our clinic. A satellite laboratory for pulmonary function (breathing) tests was installed in the clinic in 1991, so these tests can also be done on site during a scheduled visit. The Asthma Centre team is composed of seven physicians, one nurse, and one respiratory therapist. The physician team includes four general pediatricians, two allergists (allergy specialists), and one respirologist (lung specialist). The nurse and respiratory therapist are both certified asthma educators. The majority of our patients are seen on an outpatient basis, meaning they do not require hospitalization to be seen. The Asthma Clinic is located in A S1.3333, very close to the Emergency Department. Upon your arrival to our clinic, the receptionist will stamp the necessary papers with your child’s hospital card and Medicare card. If it is your first visit, the receptionist will provide you with a questionnaire on your child’s asthma symptoms, as well as a consent form for a parent or caregiver to fill out in the waiting room. A breathing test is usually performed on patients over 5 years of age before visiting with the asthma doctor. If necessary, your child may also have allergy testing done during this same visit, or be introduced to an asthma educator. Your child’s doctor might also order x-rays or blood tests as needed. If a diagnosis of asthma is confirmed, your child’s doctor will formulate a treatment plan, which will usually include asthma controller medications such as inhaled corticosteroids for daily use. The treatment plan may also include prescribed inhaled bronchodilators for the rapid relief of wheezing. More severe forms of asthma may require additional medications. Your child’s treatment is specified in a written action plan, including explanations about when to take urgent action if your child experiences breathing difficulties. Important recommendations will be given if allergies are detected in your child, or if they are exposed to tobacco smoke at home. The doctor or the asthma educator will teach the parent or caregiver how to use any prescribed inhalers and how to implement your child’s action plan. Some patients may be asked to return to the clinic for follow-up, typically three to six months after the initial visit. If a child was referred to the asthma clinic by another physician, that referring physician will receive a written report.